This past Friday, Lamb of God released its latest recording its new EP The Duke. The 5-song recording comes only a year after the release of its most recent album VII: Sturm und Drang (2015). What’s interesting about this recording is that while it is being marketed as an EP, it comes across more in the style of a single than an EP. That is due to its overall content. This is one of its most important elements. Looking more closely at the record, the studio material featured in its presentation is important to note in its own right. That will be discussed later. The live material that is included in the record rounds out its most important elements. Each element is important in its own right to the EP’s overall presentation. 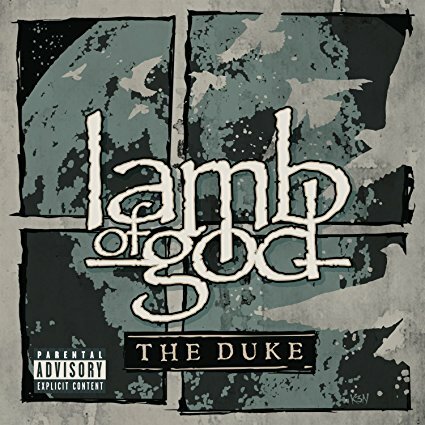 All things considered, The Duke proves to be an enjoyable new effort from Lamb of God. Lamb of God’s new EP The Duke is an enjoyable new effort from the veteran metal outfit. Considering the fact that it comes just a little more than a year after the band’s most recent album, 2015’s VII: Sturm Und Drang, it is a little bit of a surprise. Usually when established bands release such a recording it comes a little bit longer after the acts’ most recent recordings. That is to tide audiences over until their next record. Even with this in mind, the record still boasts its own share of positives, beginning with its overall makeup. The five-song recording is composed of two studio tracks and three live recordings. The studio tracks sound like leftovers, interestingly enough, from the band’s sessions for its last record. The live recordings were taken from the band’s most recent tour. In essence what that mix of material offers the band’s fans is the proverbial best of both worlds. To that end, it shows why it is such an important part of the recording’s overall presentation. It is not the only key element to note in examining the record’s overall presentation. The material itself presents its own importance to the recording’s presentation. The overall mix of material that is presented in The Duke is in itself key to the recording’s presentation. That is because it offers the band’s fans the best of both worlds in one setting. It is just one of the key elements to note in examining the record. The studio tracks included in the record are important to note, too. Listeners who are familiar with the band’s body of work will note that the songs – ‘The Duke’ and ‘Culling’ – are both very familiar in terms of their arrangements. They exhibit the same growth exhibited in VII: Sturm Und Drang. The latter presents an arrangement that echoes the arrangements composed for the band’s previous records while the prior presents the more melodic hard rock leanings included only in VII: Sturm Und Drang. Considering that, one can only think that these two songs were likely little more than b-sides that ended up on the proverbial cutting room floor during the sessions for that record. To that end, it serves as a good continuation of what the band started with VII: Sturm Und Drang and an equally welcome introduction to the band for those listeners who might not be so familiar with the band and its body of work. Even with its importance it is not the last of the recording’s most important elements. The live material that is included in the recording is just as important in its own right as the studio material. The studio material that is featured in The Duke is important in its own right to the record’s presentation. That is because it serves as a solid reintroduction to the band and an equally solid introduction to the band for those who might be less familiar with the band. Even as important as it is to the record’s presentation, it is not the last element to note. The live material that is included alongside the studio material is just as important to the record’s presentation as the record’s studio material. That is because it gives listeners a glimpse into what makes the band just as popular in a live setting as in the studio. What’s more all three of the songs featured in this recording – ‘Still Echoes,’ ‘512’ and ‘Engage The Fear Machine’ – all come from VII: Sturm Und Drang. To that end, not only are audiences able to experience the band live through these songs but they are also getting a dose of the band’s most recent album. When they are set against the record’s two “new” songs, they make a five song record that is essentially a continuation of VII: Sturm Und Drang, or VII: Sturm Und Drang Part 2. Considering this, The Duke, while a bit of a surprise release from Lamb of God, is still an enjoyable new offering from Lamb of God. This entry was posted in Celebrities, Internet, Music and tagged celebrities, entertainment, Epic Records, facebook, internet, Lamb of God, music, Phils Picks, Twitter, Wordpress by philspicks. Bookmark the permalink.